With the California state legislature designating November as Sikh American Awareness and Appreciation Month in California, there has been significant activity across the state to commemorate the month and increase awareness of the Sikh American community. The declaration by the State of California has provided a unique opportunity for the public to learn more about the Sikh American community in the state and beyond. To that end, the Sikh Coalition has provided a wealth of resources and support to facilitate Sikh awareness activities that celebrate this month. Many organizations and schools across California are taking this opportunity already. Various events and activities that have taken place or that are planned are listed below. Last week, the Board of the Elk Grove Unified School District formally recognized November as Sikh Awareness Month in the district. On Tuesday, the City Council of San Jose, California, also proclaimed November as Sikh Awareness Month, passing a resolution that recognized the contributions of Sikh Americans to the city and country (see the Facebook event page here, and a video of the ceremony here). Also, the Palo Alto VA Hospital will be holding a Sikh awareness event for their staff. Gurdwaras (Sikh houses of worship) in the cities of San Jose, Fresno, and Yuba City are hosting events for educators as well. It’s exciting to see the level of interest and reach of Sikh awareness activities by all of these organizations. This is certainly a needed step to dispel ignorance within these jurisdictions and beyond. Thanks to the Sikh Coalition for providing information about Sikh awareness events. 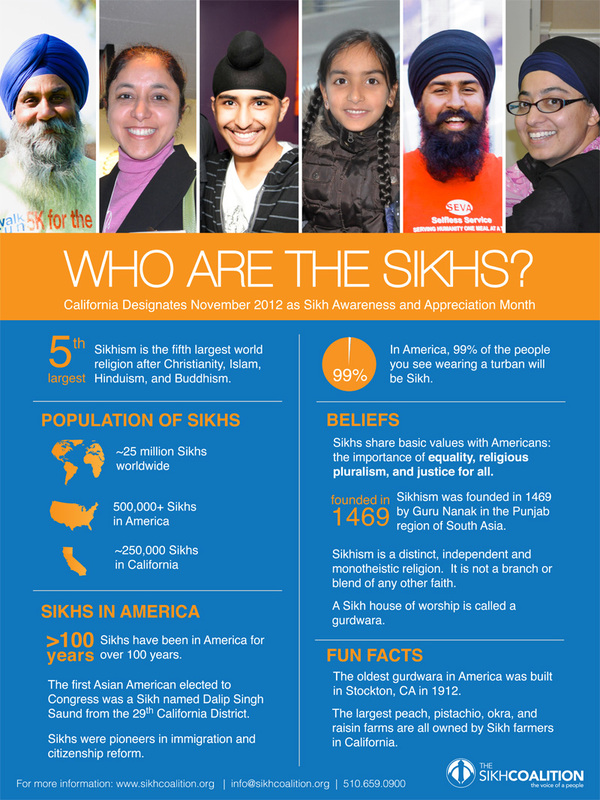 Ideas and resources to commemorate the month are available at their California Sikh Awareness and Appreciation Month webpage.